Packaging Dimensions 4 in. x 4 in. x 1 in. 1 answers Will this fit in a 70's Thomas VOX Crybaby pedal? This should work but is is always a good idea to take measurements to insure a proper fit. The total length of the pot is 42mm, diameter of bottom is 21.8mm, and diameter of the top is 12.6mm with a length of 19.mm. 1 answers This is also for jim Dunlop Jimi Hendrix wah pedal? 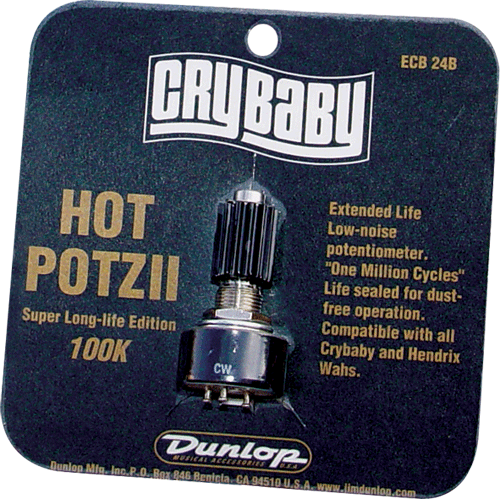 It should be compatible with your wah but we are unsure if the Hendrix wah original came with a Hot Potz II. 1 answers Will this work in a Vox V847-A pedal? It should work but we have not tried it in the V847-A. 1 answers Will it work in a Dunlop Crybaby 535q? Yes, this should work in your pedal.